Dean came to the University of Miami from Knoxville, Tennessee in 1991 after competing and placing in the 1 meter, 3 meter and Platform diving competitions at the Junior National Championships. 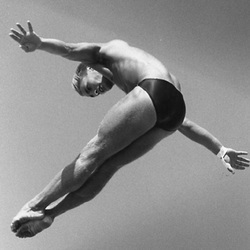 Dean continued his winning ways at the University of Miami, being the 1991 and 1992 NCAA 1 meter diving champion and in 1993 winning both the 1 meter and 3 meter championship. As a member of the USA National Team from 1989-1991 and again from 1993-1997 he was the 1993 and 1996 National Indoor 1 meter diving champion. From 1989 through 1997, he consistently placed well in the Phillips 66 National Indoor and Outdoor Diving Championships. In 1996, he placed 3rd in the US Olympic team trials in the 3 meter board. Internationally, he competed as well, earning 1st place in 1991 Swedish Cup and in 1995 won the 1 meter Championship at the XII Pan American Games, and the 3 meter Championship at the Gran Premio Internacional de Saltos. Dean graduated from the University with a degree in Business Administration. Dean currently lives in Los Angeles, California and works as an agent.